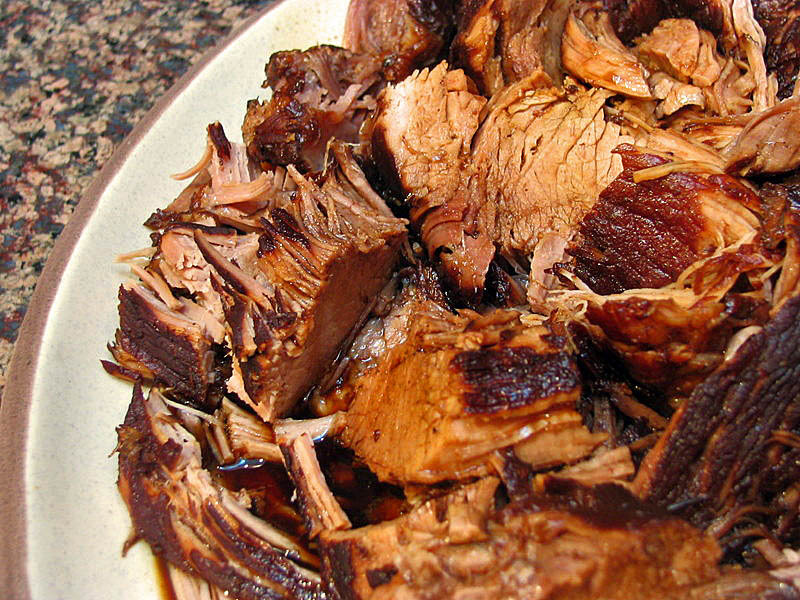 A few years ago, when Ming Tsai was a contestant on Iron Chef, he prepared his family recipe for pork shoulder in a Chinese style known as “red cooking.” Red cooking usually refers to a braise that’s intensely flavored with soy sauce, sugar, peppers and spices. The snag is that pork shoulder requires hours of cooking – a luxury he didn’t have in the hour-long show. Ming adapted the recipe to use a pressure cooker, with great success. If you like pork that’s fork-tender, with a delicious oriental flavor, then this recipe will knock your socks off. Even without a pressure cooker you can still prepare it on the stove or in the oven, but make sure to cook the meat long enough (with gentle heat) to tenderize it. In an 8-quart pressure cooker, combine the soy sauce, wine, water, vinegar, sugar, scallions, pepper, ginger, garlic, orange and cinnamon stick. Cook over high heat, stirring, until the sugar is fully dissolved. Season the pork with pepper and add it to the pressure cooker. Close and lock the cooker and bring to full pressure over high heat. Adjust the heat to maintain pressure and cook for 1 hour or until the pork is very tender. Slowly release the pressure and open the cooker. Transfer the pork to a cutting board and cover with foil. Strain 1 cup of the cooking liquid into a small saucepan; discard the remaining liquid. Boil over high heat until the liquid is reduced by two-thirds and thick, about 5 minutes. Brush a light coating of the sauce over each piece of pork to glaze it. Thinly slice the pork and serve. Comments: I’ve made this dish several times and it’s a favorite, because we use the meat in different types of meals: over white rice, as a fajita filling (with a shameless, Tex-Mex-Chinese twist), and over mashed potatoes or pasta. It freezes so well that when I make it for the two of us I save small portions that go straight into storage for easy dinners later. My pressure cooker is a little smaller than 8 quarts, so I proportionally reduce the amount of liquid to leave enough empty space in the pan. Sometimes I also reduce the soy sauce and balsamic vinegar, but the sauce remains flavorful. Depending on the quality of the meat, 1 hour of cooking may not be enough. In that case simply close the pressure cooker and bring it to full pressure for 15 minutes more.